Cartilaginous fish are the oldest extant jawed vertebrates and the oldest line to have placentae. Their pivotal evolutionary position makes them attractive models to investigate the mechanisms involved in the maternal-fetal interaction. This study describes the tissue expression of the cytokine interlukin-1 (IL-1) α, IL-1 β and its specific membrane receptor, IL-1 receptor type I (IL-1R tI) in a placental cartilaginous fish, the smoothhound shark, Mustelus canis. The presence of this cytokine has been reported in many mammalian placentae, as well as in the placenta of a squamate reptile and this study extends these observations to the cartilaginous fishes. 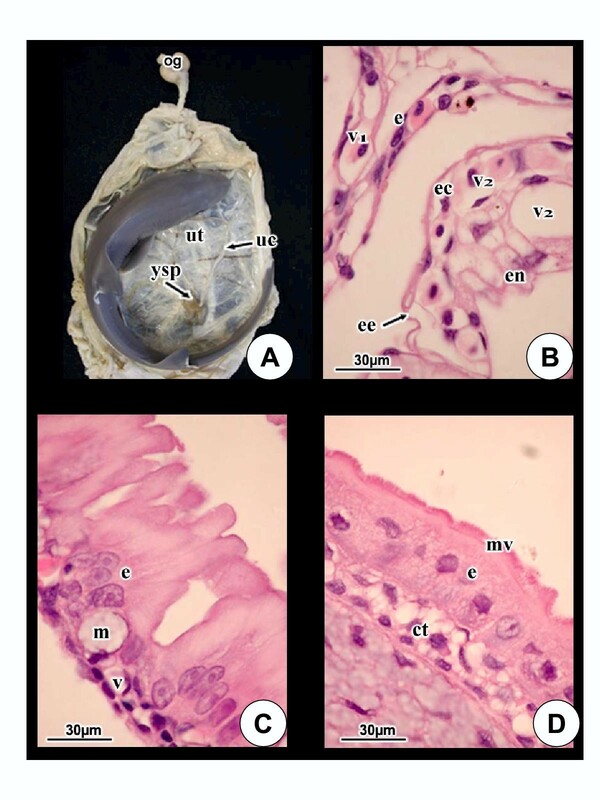 The uteroplacental complex in M. canis consists of a yolk sac modified into a functional yolk sac placenta and complimentary uterine attachment sites. Immunohistochemistry for IL-1 α, IL-1 β and the receptor reveals leucocytes of both the mother and fetus to be positive, as well as the apical aspect of paraplacental cells and the apical vesicles in the umbilical cord epithelium. Yolk sac endoderm is also positive with all the stains while the ectoderm is positive only for IL-1 α. Immunoreactivity in the uterine epithelium was obtained for IL-1 α and the receptor. The egg envelope is always negative. In light of the recent finding of IL-1 β gene in a cartilaginous fish and of the high level of conservation of proteins implicated in IL-1 action, our data suggest that IL-1 system is a key mediator of the materno-fetal interaction since the oldest extant placental vertebrates. Viviparity is a widespread reproductive mode among vertebrates, involving retention of the embryo within the female reproductive tract and giving birth to living young. Viviparity may involve the formation of a placenta, a structure formed by the apposition of extra-embryonic membranes and maternal tissues . Among vertebrates, placental viviparity is present in mammals (except monotremes), squamate reptiles and cartilaginous fishes. Although viviparity is advantageous for the nourishment and growth of offspring, it involves an immunological risk for the semi-allogenic fetus. Prolonged exposure of embryonic tissues bearing paternal antigens to maternal uterine tissues can cause rejection of the embryo [2, 3]. Among immunological mechanisms to protect the fetus and its growth in the maternal tissues, the local release of immunoregulatory peptides (cytokines) seems to play a primary role [4, 5]. Cytokines and cytokine receptors are expressed in mammalian placentae independently of the animal species or the type of placenta . Cytokines such as Interleukin-1 (IL-1) and Transforming Growth Factor beta (TGF β) are also present in the placenta of a species of squamate reptile, the three-toed skink Chalcides chalcides [7, 8]. IL-1 is one of the most pleiotropic cytokines and a central regulator of both the immune and inflammatory responses . Biological activity in response to the two isoforms of IL-1, IL-1 α and IL-1 β appears to be mediated by the receptor type I IL-1R tI, the functional receptor mediating signalling . A second receptor IL-1 R tII is thought to act as a decoy non-signaling receptor . In reproduction, IL-1 is expressed by the murine endometrium during the peri-implantation period and also by blastocysts [12, 13]. Interestingly, animal experiments have shown that implantation in mice is prevented by blockage of the IL-1R tI . Recent evidence indicates that the IL-1 system exerts a direct action on the endometrium . In humans the cytokine and the functional IL-1R tI are expressed by endometrial tissue during the late secretory phase whereas the IL-1 R tII is down-regulated in the mid-secretory phase, especially during the implantation window [16, 17]. IL-1 also promotes the success of early pregnancy in in vitro fertilized embryos , and contributes to the mechanism inducing labor . The presence of IL-1 in the placenta of reptiles, as well as in mammals, suggests that it could be an important mediator in maternal-fetal immunotolerance throughout vertebrates . Therefore, we analyzed the expression of this cytokine and its specific membrane receptor, IL-1R tI, in the maternal and fetal tissues of a placental cartilaginous fish, the only class of placental vertebrates not yet investigated. In this class of vertebrates the phenomenon of feto-maternal immunotolerance is even more striking than in others because of the occurrence of multiple paternity . The model we used was the smoothhound shark, Mustelus canis, a placental viviparous shark of the Family Triakidae. Females of Mustelus canis were captured in their natural habitat in the Chesapeake Bay and Atlantic Ocean. Animals were collected via longline at term of gestation. Four to eight embryos were normally present in each pregnant female. Animals were humanely sacrificed by blunt trauma to the chondrocranium, opened by a midventral incision and the uteri isolated. The uteri were opened with surgical scissors and tissues harvested. Tissues for immunohistochemistry were fixed in 10% buffered neutral formalin and embedded in paraffin. For normal histology, sections of specimens were stained with haematoxylin-eosin. Only histologically normal tissues were processed for immunohistochemistry. The experiments and animal captures were performed with the approval of institutional committees: Indiana University School of Medicine. Immunohistochemical staining in formalin fixed 5 μm sections was performed using a mouse antisera recognizing human IL-1 and StreptABComplex/AP (DAKO-Milan, Italy). After deparaffination in Bioclear (BioOptica – Milano, Italy) and rehydration in serial dilutions of ethanol, the histological sections were washed in Tris buffered saline (TBS) pH 7,6 and pre-incubated with normal swine serum to prevent non-specific binding. The slides were first incubated with anti-human IL-1 α (R&D Systems, Abingdon, UK), IL-1 β  and IL-1R tI (R&D Systems) monoclonal antibodies. Then, with rabbit anti-mouse immunoglobulins (DAKO) diluted 1:500 in TBS and finally with Streptavidin complex (DAKO) diluted 1:300. Each incubation was performed for 30 min at room temperature and followed by three washes in TBS. The alkaline phosphatase reaction was revealed using naphtol and new fuchsin as substrate. Endogenous alkaline phosphatase was blocked by adding 1 mM levamisole to the substrate solution. Sections were then washed for 5 min in running tap water and mounted with aqueous mounting medium. Negative controls were performed for each tissue by substituting the primary antibody with the preimmune serum or TBS. Moreover the specificity of the staining reaction was confirmed by inhibiting the mAb by incubation (overnight at 4°C) with the specific antigen (at a molar ratio of 1:1) before using it for tissue staining. The female reproductive tract of Mustelus canis consists of a single ovary and ostium leading to paired oviducts, oviducal glands and uteri. In Fig. 1A all but one of the term fetuses have been removed to show the umbilical cord and yolk sac placenta. As in other placental sharks, during the initial stages of gestation the embryo is reliant on yolk stores sequestered in the yolk sac. As gestation proceeds, yolk sac contents are depleted. Coincident with this event the yolk sac undergoes a morphological transition to an epitheliochorial yolk sac placenta. During this transition the yolk stalk elongates to form an umbilical cord (Fig. 1A). At term, the distal aspect of the yolk sac placenta abuts the uterine epithelium at special foci termed uterine attachment sites. Areas of the uterus not involved in yolk sac attachment are termed paraplacental uterine sites. The tertiary egg envelope, produced by the oviducal gland, intervenes between maternal and fetal tissues throughout gestation. (A) Gross view of gravid uterus of M. canis containing a single term fetus. Uterus (ut), umbilical cord (uc), yolk sac placenta (ysp), oviducal gland (og). (B) Light micrograph of the uteroplacental interface. Uterine vessels (v1), uterine epithelium (e), tertiary egg envelope (ee), yolk sac ectodermal epithelium (ec), yolk sac vessels (v2), endoderm of yolk sac (en). Haematoxylin and eosin. (C) Paraplacental uterine site. Columnar epithelial cells (e) with basal mucous (m) component in association vessels (v). Haematoxylin and eosin. The uteroplacental complex consists of: uterine tissues, including uterine vessels and uterine epithelium, tertiary egg envelope, and fetal tissues including the yolk sac ectoderm, endoderm and the intervening fetal vessels (Fig. 1B). Uterine vessels are in close association with the base of the surface epithelium. 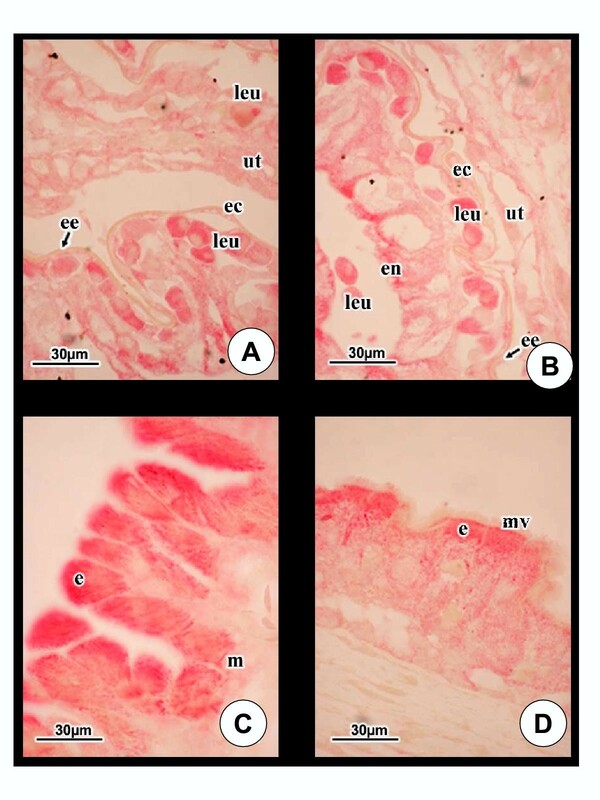 There is only scant connective tissue separating uterine endothelium from the surface epithelial lining the uterine attachment site. The uterine epithelium is generally separated from the egg envelope by a discernable space. The yolk sac epithelial ectoderm, on the other hand, is in close association with the egg envelope along most of its extent (Fig. 1B). The yolk sac endoderm is characterized by large cells that line the now empty former yolk sac cavity. As in the uterus, fetal vessels are separated from the surface ectodermal epithelium by scant connective tissue. The vessels are in close proximity to the simple to bilayered squamous epithelium. Paraplacental uterine sites are characterized by simple columnar epithelium with basal metachromatic mucous vesicles and a dense array of cytoplasmic filaments (Fig. 1C). The epithelium rests on a connective tissue zone with modest vascularity. Nuclei are basal and oval, typical of columnar epithelium. The surface of the umbilical cord consists of a simple, low columnar epithelium with abundant apical microvilli (Fig. 1D). Nuclei are oval and situated near the middle of the cell. The modest connective tissue zone separates the surface epithelium from the conduits within the cord, viz umbilical artery, umbilical vein and ductus vitellointestinalis. Staining of the uterus for IL-1 α (Fig. 2A) reveals leucocytes of uterine vessels as distinctly positive. The uterine epithelium is also positive but the stain is less intense. Staining of the egg envelope is negative and yolk sac epithelium is modestly positive (Fig. 2A). Yolk sac leucocytes are distinctly positive, as is the endoderm (Fig. 2B). The apical aspect of the epithelium of the paraplacental uterine areas is positive but the mucous component is negative (Fig. 2C). Apical cytoplasmic vesicles in the surface epithelium of the umbilical cord are positive but the microvilli are negative (Fig. 2D). (A) Epithelium (e) of the umbilical cord is simple columnar with microvilli (mv). A distinct connective tissue stroma (ct) separates the epithelium from channels within the cord viz, umbilical artery, umbilical vein and ductus vitellointestinalis. Haematoxylin and eosin. (B) Immunohistochemistry of the uteroplacental complex for IL-1 α shows the uterus (ut) and the ectodermal portion of the placenta (ec) to be modestly positive. Leucocytes (leu) of both uterus and placenta and yolk sac endoderm (en) are positive. Egg envelope (ee). (C) Immunohistochemistry of paraplacental cells for IL-1 α shows the epithelial cells (e) apices to be positive but the mucous (m) component is negative. (D) Immunohistochemistry of the umbilical cord for IL-1 α reveals cytoplasmic vesicles in umbilical cord epithelium (e) are positive and microvilli (mv) are negative. Uterine leucocytes are positive for IL-1 β while the surface epithelium is negative (Fig. 3A). The egg envelope is negative while placental yolk sac leucocytes are positive (Fig. 3B). Yolk sac endoderm is modestly positive. The paraplacental epithelium stains in a similar fashion to IL-1 α, with the apex distinctly positive but the mucous component negative (Fig. 3C). Apical cytoplasmic vesicles in the umbilical cord epithelium are positive, microvilli are negative (Fig. 3D). (A and B) Immunohistochemistry of uterus, egg envelope and placenta for IL-1 β shows leucocytes (leu) of both mother and fetus as positive, uterus (ut), egg envelope (ee) and yolk sac ectoderm (ec) negative while the endoderm (en) is modestly positive. (C) Immunohistochemistry of paraplacenta for IL-1 β demonstrates positive staining in the surface epithelium (e) while the mucous component (m) is negative. (D) Immunohistochemistry of the umbilical cord for IL-1 β shows cytoplasmic vesicles of the epithelium (e) as positive and the microvilli (mv) negative. Generally, staining for the receptor in most tissues is more intense than for either IL-1 α or IL-1 β. Uterine leucocytes are positive while the uterine epithelium is intensely positive (Fig. 4A). As with staining for IL-1 α and IL-1 β, the egg envelope is negative. Placental ectoderm is negative while the endoderm is diffuse and modestly positive. Placental leucocytes are positive (Fig. 4B). Staining of paraplacental cells continue the same staining pattern as seen for IL-1 α or IL-1 β, with the apical portion of the epithelium positive and the mucous component negative (Fig. 4C). Apical cytoplasm of umbilical cord epithelial cells are positive for the IL-1 receptor. The microvilli, however, are intensely positive (Fig. 4D). (A and B). Immunohistochemistry of the uterus and placenta for IL-1R tI shows the leucocytes (leu) of both mother and fetus positive, uterine epithelium (ut) intensely positive, egg envelope (ee) negative, yolk sac ectoderm (ec) negative and endoderm (en) modestly positive. (C) Immunohistochemistry of paraplacental cells for IL-1R tI shows the same staining pattern as for both IL-1 α and β with the apical aspect of the epithelium (e) positive and the mucous (m) component negative. (D) Staining of the umbilical cord for IL-1R tI illustrates positive staining of apical vesicles in the epithelium (e) while the microvilli (mv) are intensely positive. Chondrichthyan fishes include the sharks, skates, stingrays and chimaeras. Among these, placental viviparity occurs only in sharks, accounting for about 10% of extant species. Yolk sac placentation is limited to a few members of the Families Triakidae, the houndsharks; Family Carcharinidae, the requiem sharks and Family Sphyrinidae, the hammerhead sharks . The pioneering studies of Ranzi [22, 23] mark the first serious investigations of maternal-fetal relations in cartilaginous fishes. Ultrastructural descriptions of the uteroplacental complex were then reported by Hamlett et al. [24–28], Hamlett , Otake and Mizue  and more recently, by Fishelson and Baranes . Unlike amniotes in which four basic membranes develop, the yolk sac is the only extra-embryonic membrane present in anamniotes. In all species of chondrichthyans, regardless of reproductive mode, embryos are initially nourished by yolk stores in the yolk sac [32–35]. Initially yolk is solubilized and transported across the endoderm to the yolk sac vessels . Additionally, yolk is transported to the fetal gut by ciliary action of the ductus vitellointestinalis in the yolk stalk. 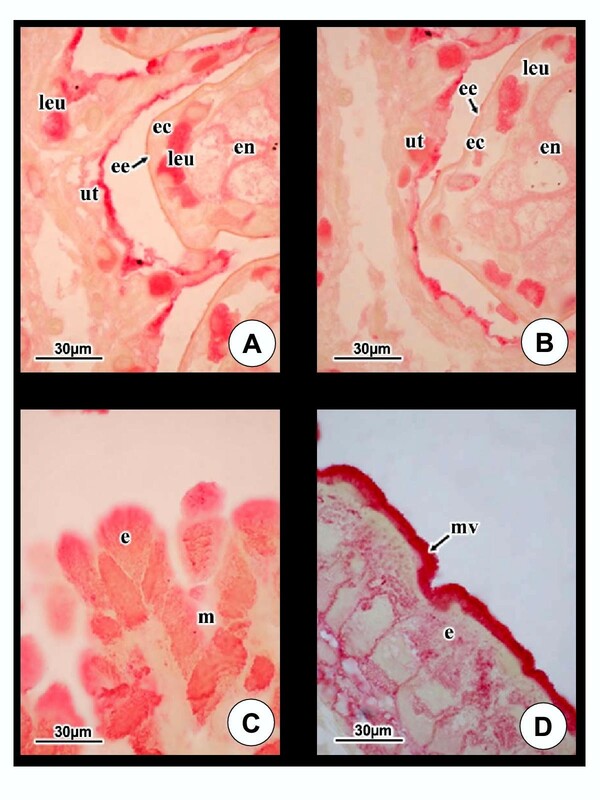 In most placental sharks, as yolk stores are depleted, the distal aspect of the modified yolk sac directly contacts the tertiary egg envelope that intervenes between the fetal and maternal tissues throughout gestation [33, 36–38]. At midgestation and in concert with diminution of yolk stores, yolk sac tissues differentiate in to a definitive yolk sac placenta. In all cases, the placenta is epitheliochorial, non-invasive and persists until term. During the ontogenetic modification of the yolk sac, a concomitant change occurs in the yolk stalk. It elongates to become an umbilical cord [29, 39]. Despite the diversity in placentation mechanisms, morphological and functional similarities have been demonstrated among vertebrates [40, 41]. In particular, the interaction of paternal antigen-bearing fetal cells and maternal tissues is a common aspect across species . This means that molecular mechanisms act to prevent rejection in each placenta regardless of its morphology or the animal species . Of additional interest in sharks is the fact that recently multiple paternity has been demonstrated [20, 42]. In the placental lemon shark, Negaprion brevirostris it was determined that at least three males had sired the litter of 13 pups . In the aplacental nurse shark, Ginglymostoma cirratum at least four males fathered 32 pups . The implications for the immune system of the female is considerable. Not only must she mount a surveillance regimen for the pups generally but in these studies there were at least four fathers with different genetic constitution. It is believed that many other shark species mate polygamously . 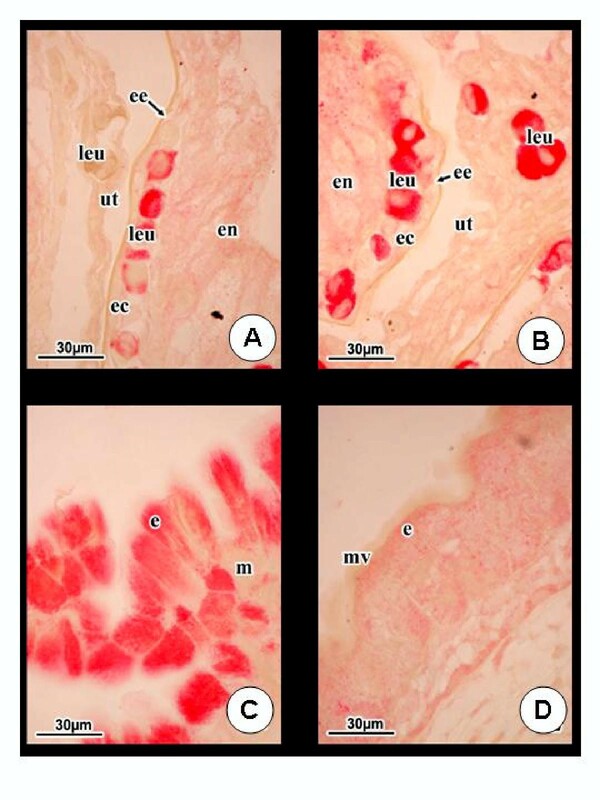 The present study demonstrates, for the first time, that the cytokine IL-1 in the α and β isoforms, and IL-1 R tI are expressed in the uteroplacental complex and in the umbilical cord of the smoothhound shark, M. canis. IL-1 is one of the immunoregulatory factors thought to mediate embryo-maternal interaction . Though the local release and action of these factors have been largely demonstrated in different species of mammals, their specific role at the materno-fetal interface still remains unclear. The finding of IL-1 in the yolk sac placenta of a chondrichthyan fish, in the chorioallantoic placentae of squamate reptiles, as well as in various types of mammalian placentae, suggests that this molecule played a critical role in the interaction between maternal and fetal tissues in placental viviparity. Moreover, the finding suggests that the role of interlukins in vertebrate placental evolution is independent of the germ layer derivative of the cells involved in placentation. The recent finding of the IL-1 β gene in a cartilaginous fish, the small spotted cat shark Scyliorhinus canicula, provides evidence that immune responses in elasmobranchs could be mediated by the IL-1 system . The IL-1 signalling system is also evolutionarily conserved in different species. IL-1 receptors show significant sequence similarities in their cytoplasmic domain to Toll-like receptors that mediate dorsoventral polarity in Drosophila and immune responses to microbial products in both insects and mammals [44, 45]. Cartilaginous fishes are the oldest extant jawed vertebrates and are thus considered a critical model for an understanding of the origin of the vertebrate immune system . In this context, studies by Marchalonis and colleagues have shown unequivocal homologies between shark and mammalian immunoglobulins . Since the cartilaginous fishes are also the oldest extant placental vertebrates, it can be argued that they should be the preferred model for studies of molecules determining fetal acceptance and growth in the maternal tissues. This work was supported by funds provided by Indiana University School of Medicine and a research grant provided by University of Siena. We wish to thank Dr. John Musick, Virginia Institute of Marine Sciences, College of William & Mary, U.S.A. for facilitating the collection of the animals used in this study and for his council on the fisheries aspects of reproduction in this species.